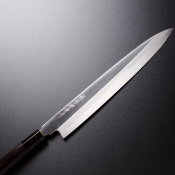 Fujiwara Teruyasu's knives are among the best in the world. These blades keep the cutting edge of the knife sharp longer than any other knife you have ever used. 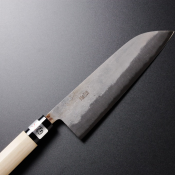 More than 140 years ago, the Fujiwara family began as a producer of agricultural tools and then of swords. 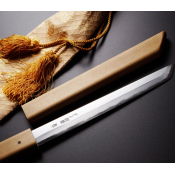 After World War II, the production for swords was severely limited, so Fujiwara San, the fourth generation Master of Blacksmith, focused on the manufacture of kitchen knives and scissors for industry as a way to restore the family's previous glory. These knives are entirely hand-forged. An ultra-hard white carbon steel core is laminated between soft and more elastic steel. 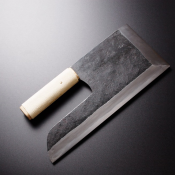 This is probably the best method of producing kitchen knives. 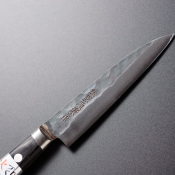 Some of the features of carbon steel include a very long blade life, easy sharpening, and exceptional cuts in cutting. 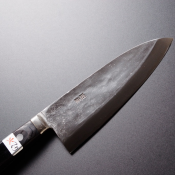 These knives require special maintenance because they rust if are not maintained properly. To avoid this, please clean with water, wipe the knives with a soft cloth and spray with Camelia oil after use. Camelia oil is the best and most harmless oil for carbon steel blades. The most unique quality of these knives is the notch in the blade where you can place your finger for a perfect balance. Typically, when the chef holds the knife, he holds with his thumb and forefinger. Fujiwara San created this “finger rest” to make this grip easier for beginners and more convenient for the experienced users. 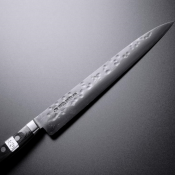 Santoku:This is also a multi purpose knife, but with a slight vegetable bias. Santoku means 'Three V.. 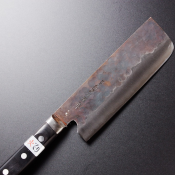 Length: 135 mmWeight: 100 grThis knife is used when cutting fish or bones. We recommend that you use.. 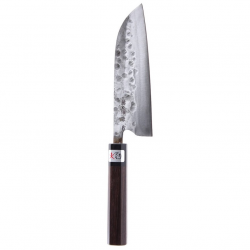 Length: 180 mmWeight: 180 grThis knife is used when cutting fish or bones. We recommend that you use.. 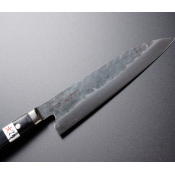 Length: 240 mmWeight: 230 grThis knife is used when cutting fish or bones. We recommend that you use..